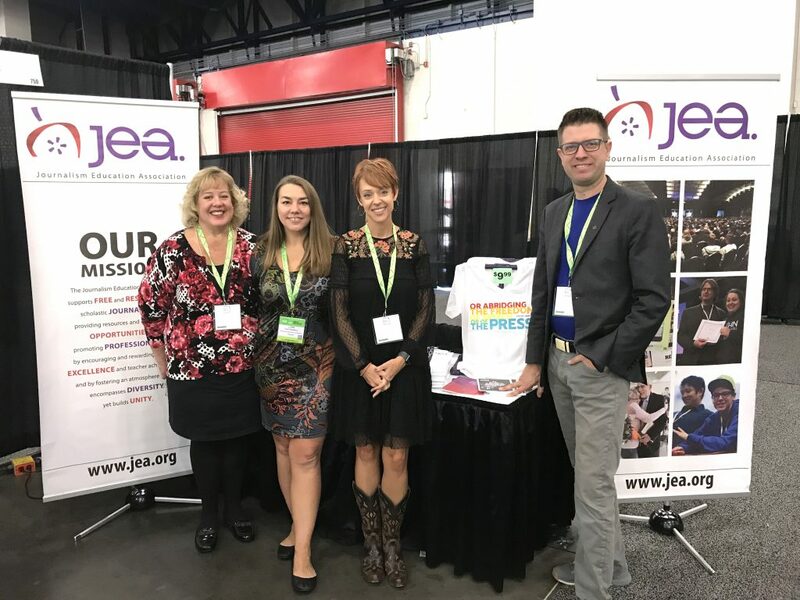 Before the exhibit hall opens at the NCTE Annual Convention Nov. 16, 2018, Vice President Val Kibler, MJE, Press Rights Director Lori Keekley, MJE, President Sarah Nichols, MJE, and NCTE Liaison Jonathan Rogers, MJE, pose at the JEA booth inside the George R. Brown Convention Center in Houston. One of multiple themes shared Nov. 15-18, 2018, at the National Council of Teachers of English Annual Convention was “focus on teaching, but also on learning.” JEA delegates used their time in Houston to do both. Jonathan Rogers, MJE, who has served as JEA’s NCTE liaison since 2015, led the group’s efforts. Rogers shared his expertise with the session “Teaching Media Literacy: Lessons in Research, Fighting Fake News and Training Truth Seekers,” co-presented with JEA President Sarah Nichols, MJE. In particular, Rogers showcased JEA’s Flipboard magazine and provided media literacy resources valuable to classroom teachers of all types. In addition to networking with organizational leaders, he coordinated a booth in the exhibit hall to showcase JEA programs and curriculum. “The JEA presence has really grown over the past few years. A major highlight was the chance to tell thousands of teachers about the great work JEA is doing to support teachers,” Rogers said. NCTE’s “Raising Student Voice” theme was a natural connection for Press Rights Director Lori Keekley, MJE, who presented “The Power of Voice” on how to incorporate editorial writing in any language arts setting. Aside from her role as a convention speaker, Keekley took the opportunity to learn from attendees what kind of censorship challenges they faced at their schools and linked teachers to Scholastic Press Rights Committee resources. In addition, Keekley participated in a panel on censorship, with student expression topics ranging from the story of Mary Beth Tinker to a virtual segment with Prosper (Texas) High School student journalist Neha Madhira. “The panel really highlighted the importance of students having voice. It’s important for NCTE also to stand behind student voices and understand the need for student free expression legislation,” Keekley said. She promoted the New Voices movement and provided suggestions for how teachers can get involved. Nichols also taught a session, “21st-Century Storytelling Through Digital Media,” with Rogers co-presenting, but said her role as a learner was most valuable. “The emphasis on empowering student voice in each keynote and general session was inspiring and validating. While I appreciated the opportunity to network with other teachers, observe a new-to-me convention model and promote our organization, I was most struck by the potential for JEA to do more to help expand media literacy education. Every teacher there wanted nothing more than to help students think critically and use their voices in meaningful, authentic ways, and it was powerful to see the lightbulb go off each time we demonstrated how scholastic journalism does all that and more,” Nichols said. The group had extra support throughout the convention activities, as Vice President Val Kibler, MJE, and Director-at-large Julia Satterthwaite, CJE, also attended as part of their respective schools’ English department delegations. Both volunteered their time at the JEA booth and helped host a social event to connect with other student media advisers, an idea Rogers developed based on previous NCTE convention experiences.